Elizabeth Anne Weddings: DIY day 5:the new candy buffet:::popcorn! Seriously, whenever I make popcorn anywhere people just come flocking! It's super cool how it brings people together. That's why I picked this next DIY for you to consider. It's a fun alternative to the candy buffet and is bound to be just as popular. -small paper bags with inner plastic lining, found at party supply stores and craft stores in the food and candy making aisle. 1. clean those containers thoroughly that you are placing the popcorn in! 2. decorate the popcorn bags! imagination can go wild here but here is a basic design: cut strips of patterned paper 1 1/2 in high, making sure the width spans that of the bag. 3. apply double sided tape to the back of the patterned paper strips and apply them to the front of the bags, midway from front to top. 4. make labels for the popcorn tins. make a document on the computer that is an appropriate size to fit your tins. Print the labels on white card stock and cut them out. 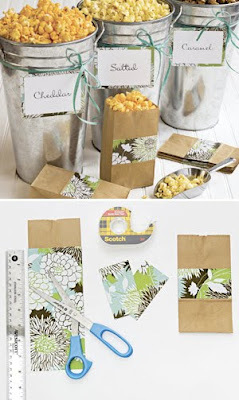 5. cut pieces of patterned paper 1/2 in larger in length and width than the popcorn labels you printed. place strips of double sided tape on the back of the flavor labels and attach them to the pieces of patterned paper. use tape to attach the new labels to the popcorn tins. 6. I would suggest homemade popcorn. It's so much more delicious than store bought. Whatever kind of popcorn you make be sure to seal it in a tight plastic bag until it's ready to use. Your popcorn will stay fresh this way a couple days in advance. 7. Make sure you have a designated person filling the popcorn tins at the reception [hmmm...a wedding coordinator fills this job! :)] and provide scoops for each tin. No one wants dirty hands in their popcorn! -if you choose to make your popcorn, it's best to not use real butter or margarine-it will make it wet and soggy. try dry butter flavored seasonings instead. - for extra flavor, set out shakers of extra seasonings for guests to create their own signature flavors. try fun combos like cinnamon-sugar, chipotle-cilantro, and parmesan-garlic.